Opposition heavyweight and former Prime Minister Lee Hae-chan announced Tuesday he was leaving the main opposition party to run independently, a day after he was denied candidacy in a controversial shakeup led by the interim leadership. 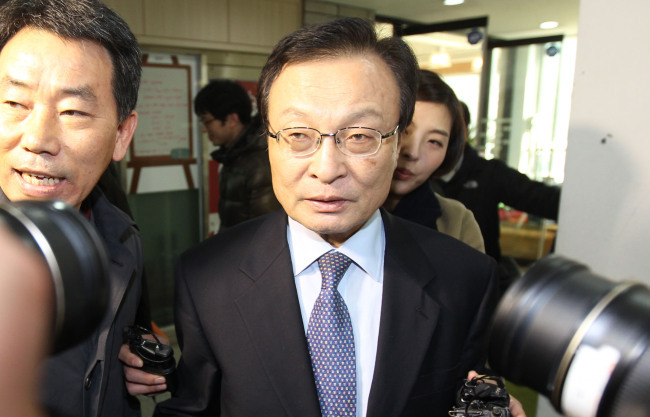 “I plan to leave The Minjoo Party of Korea,” said Rep. Lee, sixth-termer and incumbent representative of Sejong City, announcing his independent candidacy. “The Kim Chong-in leadership has vaguely cited political reasons, but this is not a proper approach to politics,” he said. Lee has been considered an iconic leader of those who were close to the late liberal President Roh Moo-hyun. Lee’s defection further escalated the widening feud at the Minjoo Party, reeling from the aftermath of what critics called a brutal elimination of some of the party’s odds-on players by interim leader Kim. They accuse Kim of acting out of his commitment to exclude the old guard and to expand his leverage over centrist groups, thereby reducing the party’s election chances. The party leadership contended that the decision on Lee was inevitable. “(Lee’s exclusion from nomination) is a political decision, in due consideration of the overall electoral context,” said Minjoo Party spokesperson Kim Sung-soo. Lee has been considered a strong asset for the party since he agreed to a party request to run in the new administrative city in 2012 and won comfortably, with 46.8 percent of the votes. His weak point, however, is that he represents the pro-Roh clique, which party chief Kim pegged as responsible for the party’s constant power feuds. The leadership’s explanatory tone hinted that Lee had been ruled out due to his symbolic affiliation to the former administration, not because of his legislative performance or chances of electoral success. The interim leadership’s unsparing decision to cut him off had also been applied to Rep. Jung Cheong-rae, a Seoul second-termer who had won public recognition for his hardball speeches during the record-long filibuster last month. Rep. Jung not only belonged to the pro-Roh faction but also spoke for the party’s extremists, another group which Kim had pledged to reduce. A number of opposition supporters vowed to boycott the party unless Jung was accepted, but the leadership remained unperturbed, rejecting the lawmaker’s request for a reexamination. The exclusion of two symbolic pro-Roh figures also indicated that the Kim leadership intends to erase the vestiges of former party leader Rep. Moon Jae-in. Moon resigned from the party leadership earlier this year, voluntarily yielding all power to Kim, amid growing criticism that the pro-Roh clique was monopolizing power. The nomination committee’s stance was reaffirmed late on Monday, when it denied candidacy to a young designer who had joined the party late last year upon Moon’s invitation. “My (candidate qualification) interview, which ended in less than five minutes and only consisted of insignificant questions, was quickly followed by a rejection notice,” said Kim Been. Those who won the qualification were mostly conventional party members, including a former spokesperson of the party’s Seoul regional headquarters.